Just because an artist is obscure doesn’t mean she’s good. Is a rigorous eclecticism possible? Can you admire, simultaneously, works of art that reflect widely and even wildly differing styles and sensibilities? I want the answer to be, “Yes.” I believe the answer must be, “Yes.” Only a heterogeneous sensibility can match the heterogeneity of our experience. But I know that nothing is more difficult to maintain than a rigorous eclecticism. The trouble is that knowledge is constantly being confused with knowingness. You are always in danger of losing the sense that fuels the sensibility. In our postmodern times, everybody has their personal artistic pets. Artists who for one reason or another have been regarded as marginal are suddenly given a little attention. This can be cause for celebration. I am also sometimes left wondering if certain artists are only seen as interesting because they are seen as marginal. I am an admirer of that funky mystic, the Bay Area painter and collagist Jess Collins. I am interested in Frederick Hammersley, whose abstract paintings, simultaneously purist and intimist, have long been associated with a classicizing impulse in mid-century Los Angeles. And I think there are considerable virtues in the casually romantic landscapes of Seymour Remenick, currently the subject of a retrospective at the Lancaster Museum of Art. I worry, however, that too often these lesser-known artists are treated a little like flea market “finds”—as curiosities, as oddball stuff. What is marketed as a rigorous eclecticism—as a swaggering, independent taste—can degenerate into a sugar-coated version of William Carlos Williams’s great plea for particularity. In place of Williams’s “No ideas but in things,” we have something more like “No ideas but in funky, curious, odd, off-beat, amusing things.” In recent weeks a good deal of excitement has been generated by the retrospective at the Whitney Museum of American Art devoted to Paul Thek, who died in 1988. 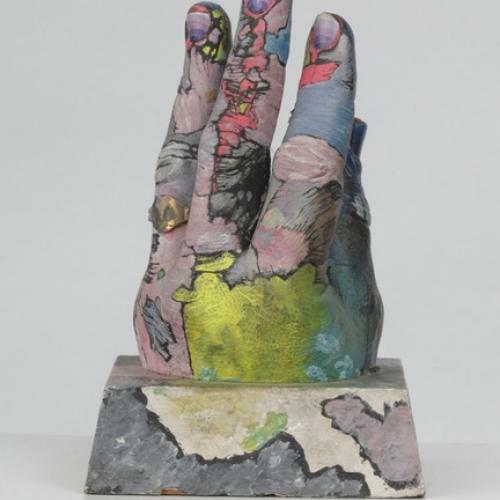 Thek’s work is certainly eclectic, ranging from mixed-media renderings of pieces of raw meat, to castings of his own body, to performances, to roughhewn paintings of seascapes and figures. In spirit and sensibility he suggests a marginalized Bruce Nauman. Is the enthusiasm for his work based on what is actually there in the galleries? Or is this enthusiasm a function of our personality driven period? Has the marginality of the artist’s reputation, whatever its causes, been mistaken for a new form of artistic originality? Is this nothing but the latest version of Warhol’s 15 minutes of fame, with everybody now granted 15 minutes of fashion-forward marginality? 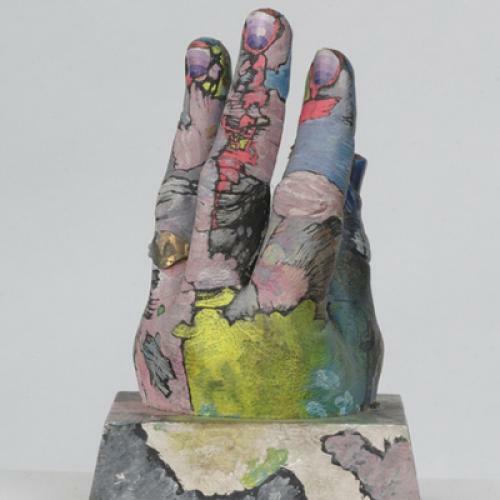 "Untitled (Hand with Ring)," Paul Thek, 1967. A rigorous eclecticism must be grounded in a rejection of all the old, exclusionary ideologies about art. But where does that rigor come from if not from a deep familiarity with the old orthodoxies? Edwin Denby, that most unpolemical and delicately intuitive writer about the dance, once observed of his friendship with de Kooning in the 1930s that what was interesting in the Leftist talk of those times was “the preemptoriness and the paranoia of Marxism as a ferment or method of rhetoric.” It took me years to realize that it was the ferment and rhetorical method of Marxist analysis that accounted, deep down, for the incisive free-spiritedness of Denby’s own criticism. And it took me years to fully understand a heated exchange that occurred in the winter of 1974 at the Figurative Alliance, a gathering of painters on the Lower East Side to which I sometimes went with friends. One night there was a panel that included the painter Leland Bell, whose ideas meant a great deal to me and still do. Alice Neel, nowhere near as famous as she is today, was in the audience, sitting right up front. And during the question-and-answer period, Neel raised her hand and said of the Mexican muralist Siqueiros, who had recently died, that his long life should be acknowledged by the artists gathered that evening. Neither I nor the friends I was with have ever forgotten how Lee Bell stood up from his chair, walked to the edge of the stage, and, with his eyes bulging, pointed a finger at Alice Neel and shouted: “Alice! I won’t talk about Siqueiros! Youth! Age! It means nothing! The only thing that matters is the quality of the work!” We hardly knew what it was all about. But now I do. Bell’s rigorous but utterly personal and idiosyncratic formalism—his fascination with the interplay between nature and artifice in the work of Giacometti and Derain and Dufy—had been forged in opposition to all the mechanistic views of the history of art. And so Siqueiros’s belief that the quality of a work of art depended on its social relevance was abhorrent, something to be rejected in no uncertain terms. Eclecticism, if seriously maintained, is the idea that a variety of creative expressions, many inherently or at least apparently irreconcilable, can be valued simultaneously. Back in 1988, after some days going to the galleries, I wrote that “the entire history of art is now an Arabian bazaar …and our only defense against the dishonest and the second-rate is our freedom to choose.” This still strikes me as true. And yet as I turn these words over in my mind today, I am bothered by the analogy to the bazaar, with its suggestion that we are all shoppers. The postmodern mentality had turned the gallerygoer’s essential experience, which had once involved judging, into something closer to the take-it-or-leave-it experience of shopping, and I was responding to that mentality when I wrote nearly a quarter of a century ago. The real question, then as now, is how we choose. Our choices, although they can be idiosyncratic, must be fueled by pressures and preoccupations that have nothing in common with the choices we make when we decide whether to buy the black socks or the patterned socks—or end up buying both. Too often now, there seems to be something a little weightless about the interest in Jess or Hammersley or Remenick or Thek. To admire an artist for his own sake, although certainly a compliment, can also be a way of suggesting that he has no place in the larger scheme of things. When it comes to the development of a rigorous eclecticism, our freedom to choose is not so much a choice as it is a necessity. And the necessity of eclecticism must be grounded, deep down, in an idea about the unity of the arts, about the braided-togetherness of all experience. Which brings us back to the old orthodoxies. There are lessons to be derived from their rigor, even from their pigheadedness.